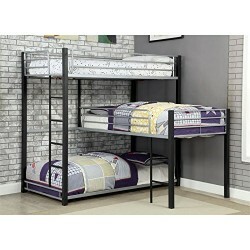 Shape your room with the Turner Triple Bunk Bed. The unique L shape design offers a sophisticated look while the two-tone finish instantly captures attention. Easily climb to upper bunks with the dual ladders and sleep safely with slatted guard rails protecting each side. Crafted from metal for lasting endurance the Turner Triple Bunk Bed instantly saves you space and elevates the look of your home.